Rainforest Recyclers: Tractor Millipedes, Polydesmida, and Giant African Millipedes, Archispirostreptus sp. This millipede is as useful as it is pretty, helping recycle decaying organic matter on the forest floor. While the northeastern United States digs out from winter storms Pax and Quintus, Bug of the Week continues its tropical sojourn with stops in Costa Rica and East Africa. On our recent visits to the New World tropics, we met winged wonders including blue morpho and malachite butterflies, cryptic lanternflies, hairy tarantulas, and fierce army ants. Our first stop this week is the Montaña Azul in Costa Rica where tractor millipedes roam the forest floor. Dozens of tiny legs move in synchronized waves to propel the tractor millipede as it searches for food. Upon encountering the Polydesmid millipedes, it’s easy to see how they get one of their common names, tractor millipedes. Flattened dorsal plates create the appearance of a tread from a tractor tire moving across the forest floor. These millipedes are blind and use the senses of touch and smell to find delicious rotting organic matter that serves as their food. Millipedes and their cousins centipedes are not insects, but instead belong to a group of arthropods called the Myriapods, many legged creatures. 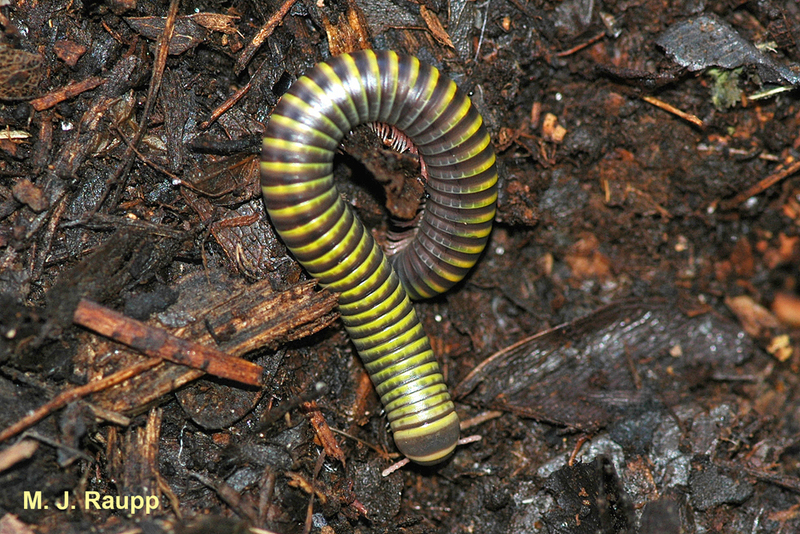 Contrary to their name, millipedes do not actually have one thousand legs. If one were to buy shoes for all of their tiny feet, between 40 to 400 pairs would do the trick depending on the species. Most body segments with legs bear two pair rather than a single pair as would be found on centipedes. This is an easy way to tell centipedes from millipedes next time you happen on one in the garden. Although Costa Rican tractor millipedes are mighty impressive with a body length of roughly six inches, the real leviathans of the millipede realm reside in tropical Africa and dwarf their Costa Rican cousins. These behemoths are found in the warm tropical forests where they bulldoze through leaf litter and soil in search of decaying plant material. How do animals so large and apparently so defenseless protect themselves from hungry predators of the rainforest? The primary defense of the millipede is to curl into a tight ball and protect its tender underbelly. The plates on the back and sides of the millipede are sturdy. Many species of millipedes also wage chemical warfare as a method of defense. Several species bear glands lining the margins of their body. Different species secrete a variety of noxious chemicals such as quinones, phenols, and hydrogen cyanide when provoked. These chemicals are repellent and act as deterrents to insects and small animals interested in munching on a millipede. It is always a good idea to wash your hands after handling these critters, even the ones found in your back yard in Maryland such as the rather dinky millipedes and centipedes in a previous episode of Bug of the Week, Life and Death Down Under. Giant African millipedes reach a remarkable size and can exceed 10 inches in length. However, fossil remains of a relative called Arthropleura have been found in Nova Scotia. This giant was roughly eight feet long. Imagine encountering one of those while wandering through the rainforest at night! The wonderful book "For Love of Insects" by Tom Eisner was used as a reference. We thank Earlene Armstrong for allowing us to photograph her giant millipedes and Ellery for letting them crawl on her hands.